Glaucoma is one of the common eye diseases of aging. In the early stages, you may not notice any symptoms, but the condition can gradually steal your ability to see. Regular eye exams can detect the development of glaucoma, so you can preserve your vision. 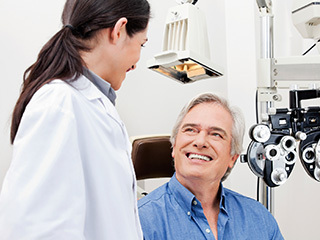 At Advanced Eye Care Associates in Providence, RI, we offer testing and management of glaucoma in our patients. Glaucoma is a progressive eye disease that mainly affects individuals over the age of 60. Two different forms of the disease exist. Open-angle glaucoma makes up the majority of glaucoma cases. This form of the disease typically presents with increased eye pressure which damages the optic nerve. Angle-closure glaucoma is less common, but it can lead to sudden vision loss. Individuals over the age of 60 are at greater risk for developing glaucoma. African-Americans, Asians, and Native Alaskans are also at greater risk. If you have a family history of glaucoma, see your optometrist regularly for testing. If you have experienced an injury to your eyes, you are at higher risk for glaucoma. If your doctor prescribes corticosteroid medications frequently, you are at higher risk. Individuals who are very near-sighted appear to be at greater risk for glaucoma. In the early stages, you may not have any symptoms. In later stages, you may notice blind spots in your peripheral vision or tunnel vision. Angle-closure glaucoma is a medical emergency and may cause eye pain, severe headache, blurred vision, nausea, vomiting, and haloes around observed lights. Regular visits to the eye doctor are the single most important way to protect your vision as you age. The doctor will test the pressure in your eyes to determine if you are at risk for glaucoma. During exams, your eye doctor will examine the internal structures of your eyes to detect early signs of damage from glaucoma. Medications and drainage devices can help to prevent damage to vision. If necessary, eye surgery may be used to improve drainage and reduce pressure in your eyes. The doctors at Advanced Eye Care Associates use their extensive training in optometry to provide the highest quality eye care for our patients in Providence, RI, and surrounding areas. We offer a broad range of vision care, including exams, eyeglass fitting, contact lens fitting, pediatric eye care, LASIK vision correction, and treatment of eye diseases. Call Advanced Eye Care Associates today at 401-331-2020 for an appointment to have your eyes tested for glaucoma and learn the best ways to protect your vision throughout life.